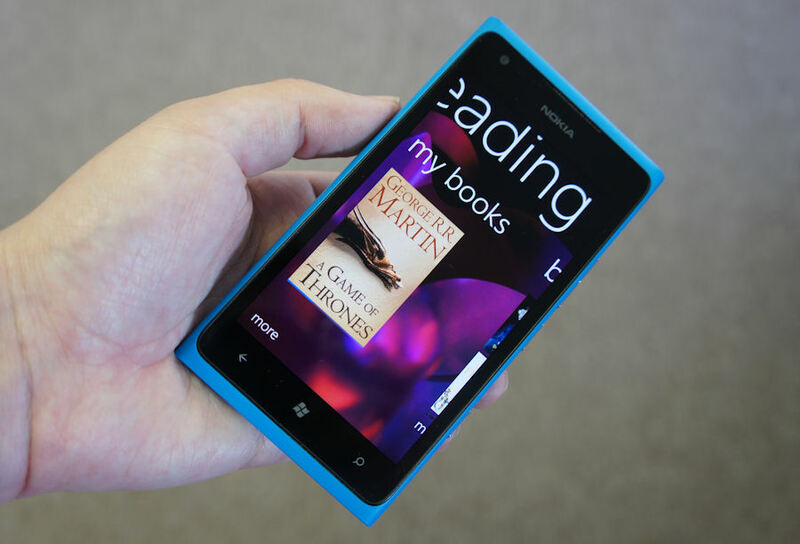 We recently reported that Nokia Reading was finally rolling out to Lumia devices, and only a few days later we have it in our hands here at All About Windows Phone. Here's our in-depth review, exploring every detail of what this latest Nokia exclusive has to offer Lumia toting book worms. What we have here is painless purchasing, and a reading experience that is on par with competing products. The only fly in the ointment is the potential of lock-in for those using multiple device platforms. 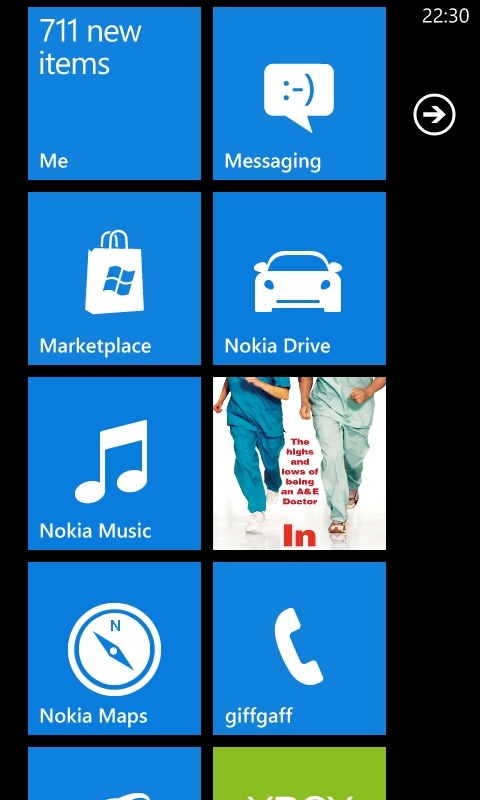 Nokia Reading is the latest of Nokia's exclusive applications; along with Nokia Music it provides another exclusive content consumption channel. As discussed with the head of Nokia Reading's user experience team in an interview by Nokia Conversations, this first release focused on getting and reading ebooks. The RSS feed reading capability (News Stream) and audio book support that some users may have read about will be coming in later versions. 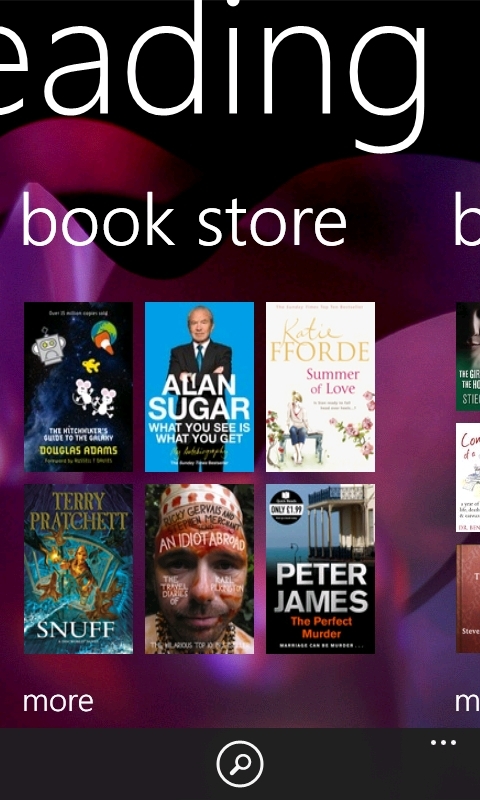 Nokia Reading's top-level screen has three sections: My books, Bookstore, and Booklists. Under each, cover art of relevant and featured books is displayed. Clearly, the bookstore is a fundamental part of Nokia Reading, and the MetroUI panorama works very well for discovering ebooks. 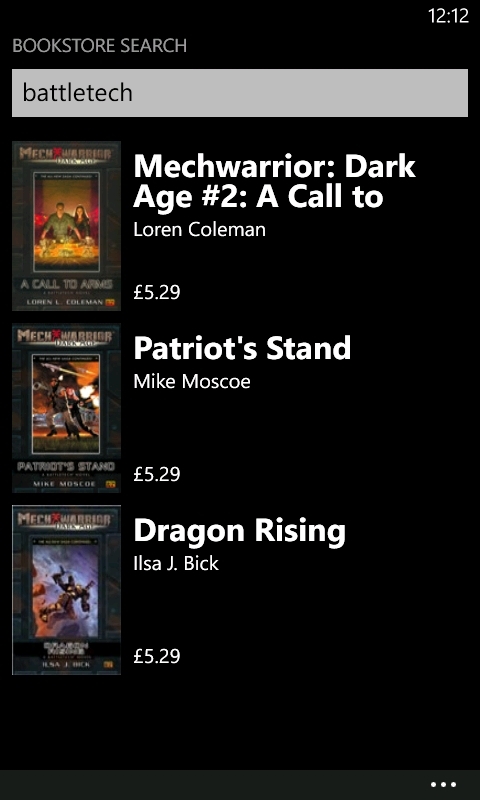 The bookstore panorama sections are 'featured books', 'booklists' (same as above), and 'genres'. 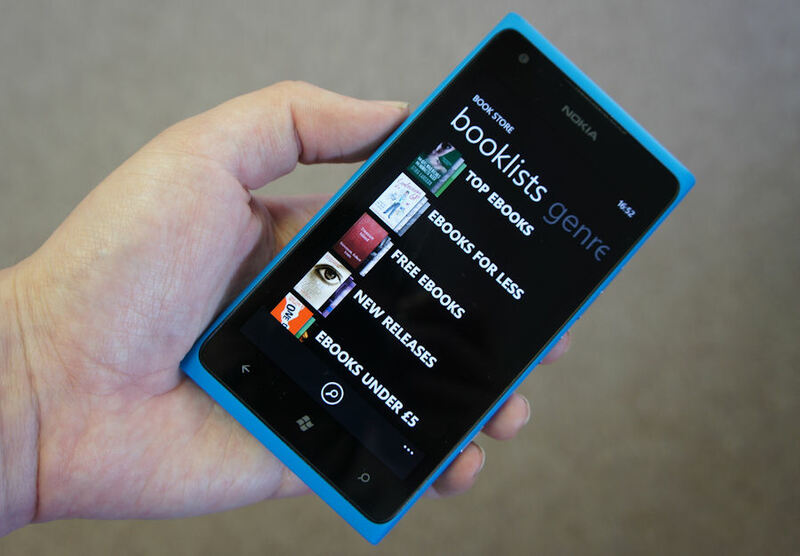 Booklists can be thought of as the literary equivalent of Mix Radio in Nokia Music – that is content recommended by Nokia around certain ideas or sub-genres. They could change over time, but at the time of writing consist of 'Top Ebooks', 'Ebooks for less', 'Free Ebooks', 'New releases', 'Ebooks under £5', 'Quick reads', 'Popular non-fiction', 'Dark Romance', 'Out of this world', 'Escape the everyday', 'Masters of suspense', 'The sports page', and 'Kids and teen reads'. Genres provide much wider categories, based on more recognisable terms. 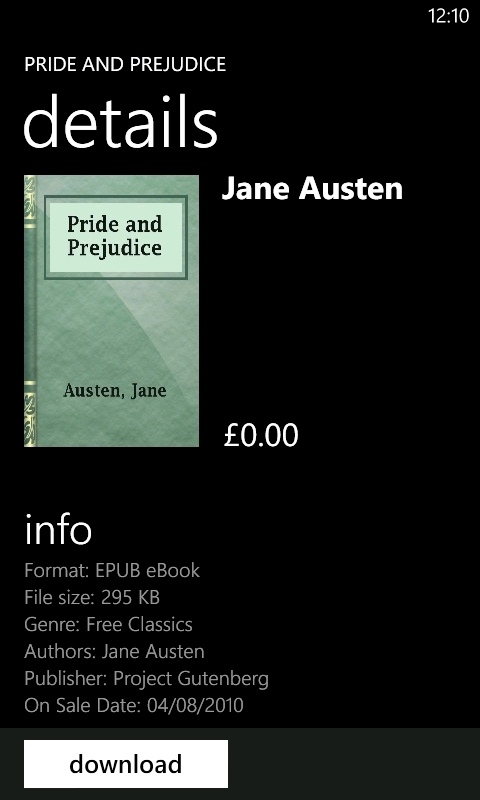 Tapping through to any single genre provides a new panorama where the user can see books listed under 'bestsellers', 'by release date', and 'by price'. All of which are great ways to find whatever you're looking for, whether you want something popular, recent, or cheap. 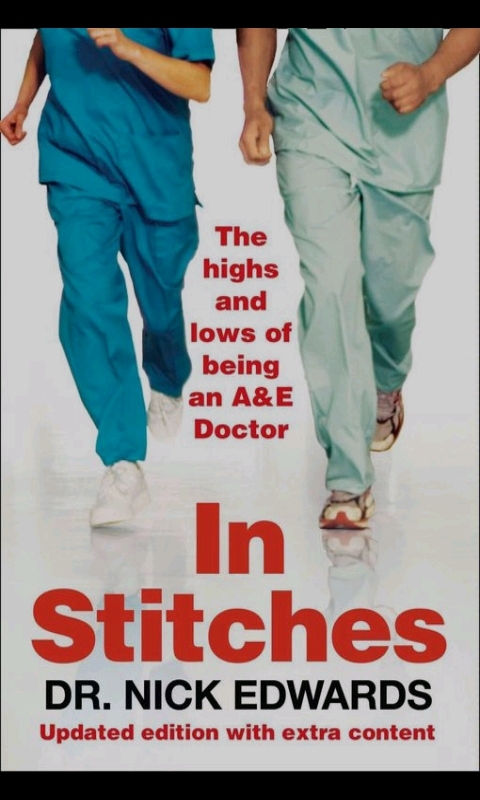 There are quite a number of books available for nothing or less than £1.00. 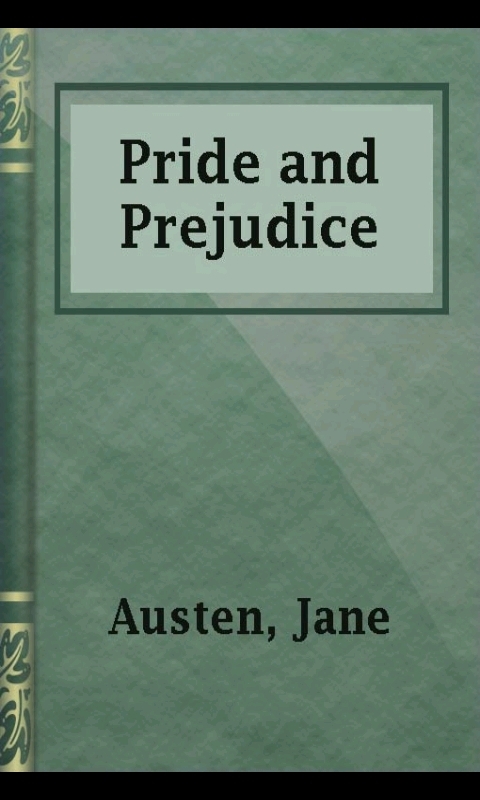 The genres on offer are Biography, Business, Children's fiction, Family and relationships, Fiction and literature, Free classics, Historical Fiction, History, Humour, Mystery and thrillers, Non-fiction, Politics and current events, Romance, Science fiction and fantasy, Self-Improvement, Sports, and Young adult fiction. Once you've settled on a book to read, you need to get it to your device, and this is where the user experience closely replicates that of the Windows Phone marketplace – which is good as it provides consistency. Details for each book provide a summary, file format (always EPUB, as far as we've seen), author, ISBN, etc. Additionally, just like the application marketplace, some titles have a 'Try' option, whereby you can download a limited amount of the book, usually the first chapter, to try before you buy. 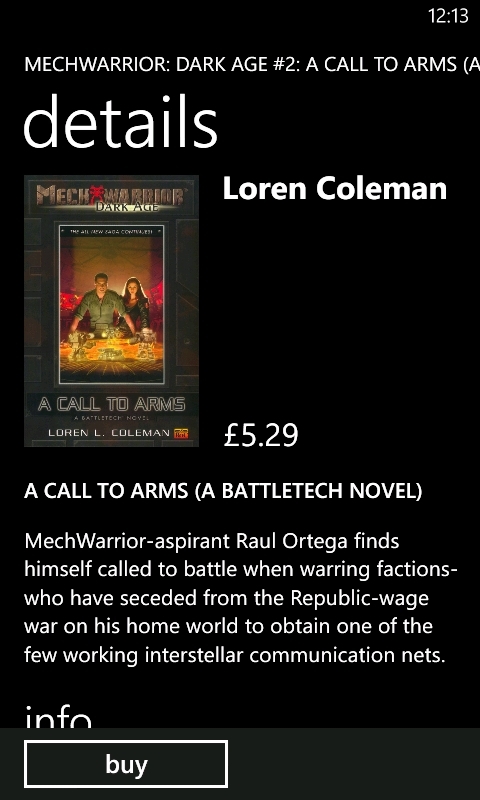 This mirrors the philosophy of "customers should never regret a purchase" espoused by the Windows Phone development team, and is a positive differentiator from the Amazon Kindle application. Purchases are linked to your Nokia account, and Nokia Reading will already know your username from when you set up your Lumia device. However, you will have to provide your password. At this point, if you've purchased items through Nokia before, e.g. on a Symbian device, your payment details will already be stored. Nokia Reading is based on Adobe's Mobile Reader technology (also used by Kobo, Sony Reader and many others), and while the use of a Nokia ID is convenient for getting started, the lack of an association with an Adobe ID presents a problem of portability which will be discussed further in the conclusion. 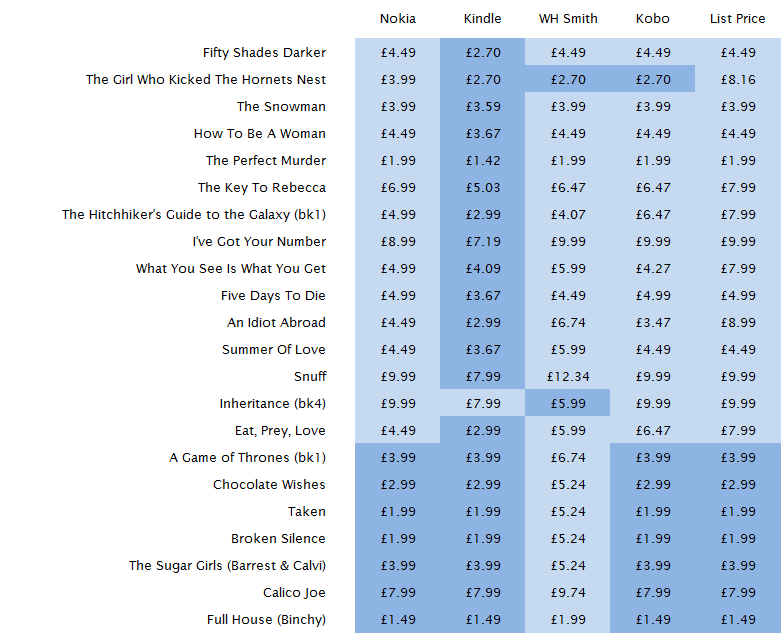 The chart below compares prices of the twenty two titles in Nokia Reading's 'Featured List'. While this is not an exhaustive survey, these are the titles Nokia are currently promoting, and so one would expect them to be competitively priced. In the chart, minimum prices are highlighted in dark blue; and as you can see, Nokia Reading is in-line with both the Kobo market and list prices. It shouldn't be a surprise to see that Amazon's Kindle has the lowest price on most titles, because Amazon can negotiate different deals with publishers than the publishing aggregators that Nokia has licenced its library from. As a brief digest of our figures, Amazon had fifteen titles cheaper than Nokia Reading, while the remaining seven were equal. Compared to Kobo, (a different) fifteen titles were of equal price to Nokia Reading, while three titles cost more and four titles cost less. 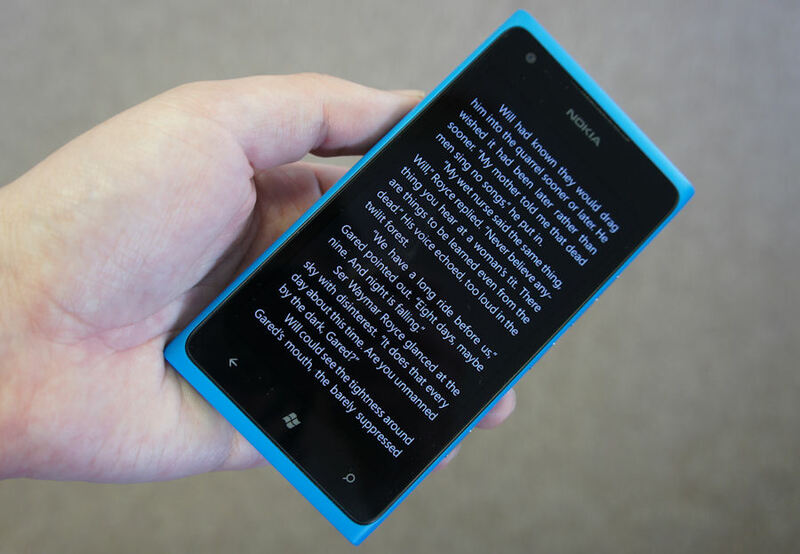 Nokia Reading offers a great reading experience, with the user interface being on par with the Kindle application for Windows Phone 7. As mentioned in the Nokia Conversations interview, there are no distracting effects in an attempt to produce the effect of turning a paper page. 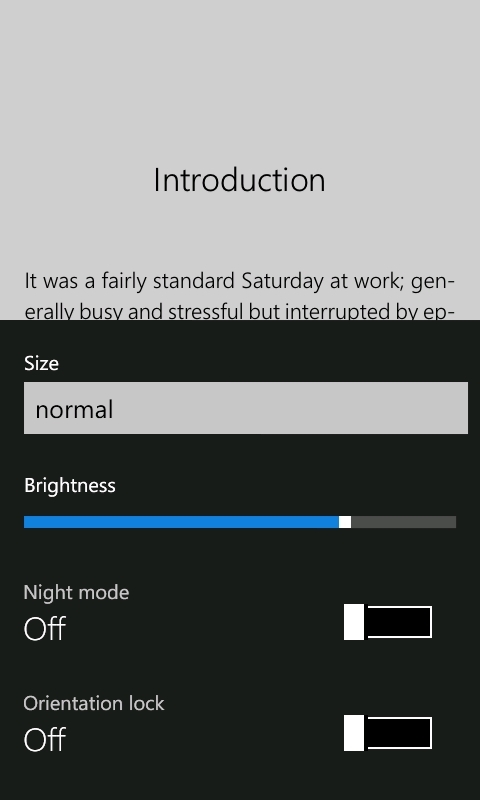 Nokia Reading display settings and the Night Mode in action. You can pick between five font sizes, which offer a large enough size for even those with extremely poor near vision. You can also change brightness, and toggle the orientation lock – e.g. to prevent the phone from switching into landscape mode if you happen to lean over in your chair one degree too far! The 'night mode' switch allows you to toggle between black on grey and grey on black. Note the absence of white – the grey background helps to give a more paper-like appearance and will cause less eyestrain than stark white. However, if this is not to your taste, the particular shade of grey almost turns white when the brightness is set high. So there's something for everyone – unless you like a sepia colour scheme. However, 'power users' (a polite term for geeks) will probably opt to keep the 'night mode' on at all times to save battery power. 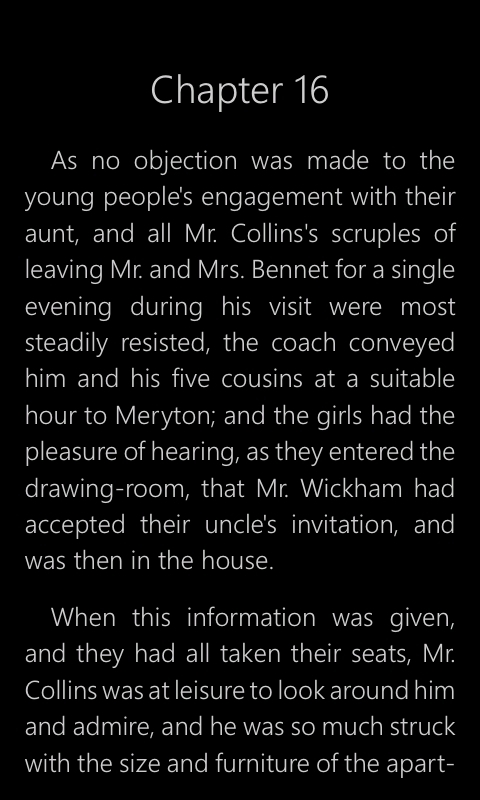 As you'll find in various other reading applications, a tap at either side of the screen will cause the page to turn, as will a swipe from one side to the other. If you were wondering whether the volume keys would turn pages too – they don't. 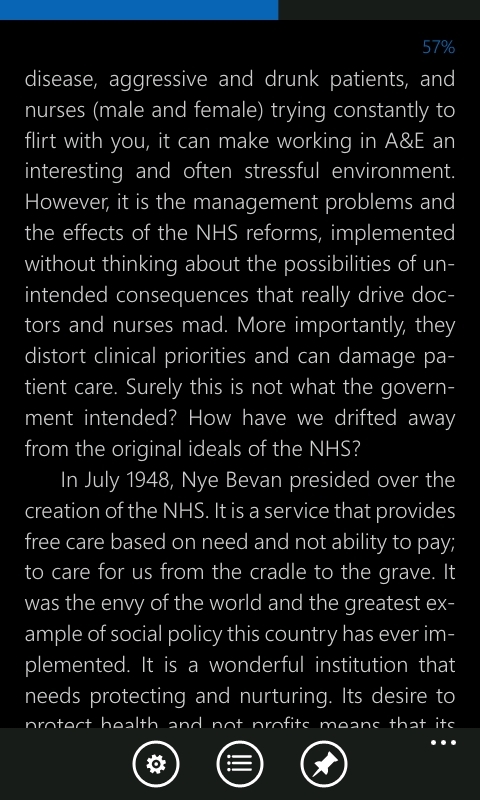 To see how far along in the book you are, just tap in the centre of the screen. A progress bar will be shown at the top, along with an expanded toolbar at the bottom. Once visible, the progress bar can be dragged to any value, allowing you to quickly move around in the book. However, these values are limited to integers; and there's no way to see, or enter, a precise (i.e. decimal) percentage, so returning to a specific point could be hit and miss. While there's no way to create multiple bookmarks or comments, the contents list is always available via the toolbar, allowing to you skip large parts of a book. Nokia Reading does, however, remember the last page you read, and will open the book there when you return. While viewing a book, you can use the pin icon on the toolbar to pin the book to your Start screen. Once pinned, the book's cover art is displayed, and regularly flips over to show the first line of the last page you were on. Tapping the tile takes you straight back to where you were in the book, thus acting like a bookmark. 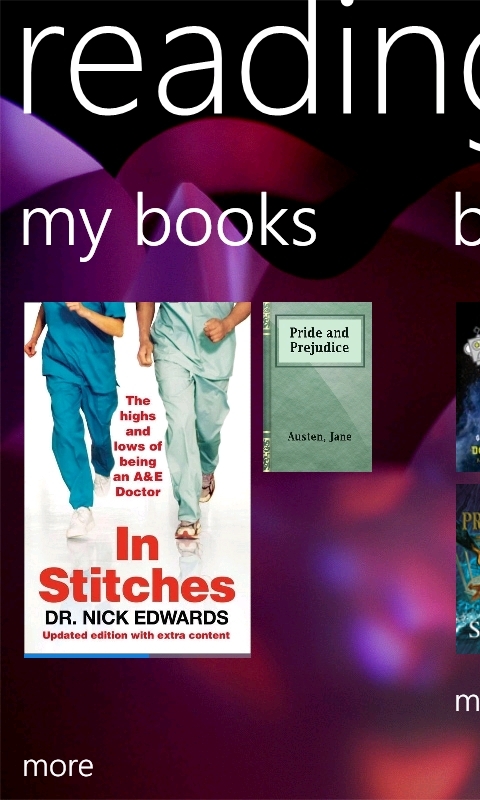 There's no lending of books in Nokia Reading, but the 'Share this book' menu option, while reading, allows you to post a social network status stating which book you're reading and on which device. There's no hyperlink, so your friends can't view information about your book though, or even directly buy a copy. 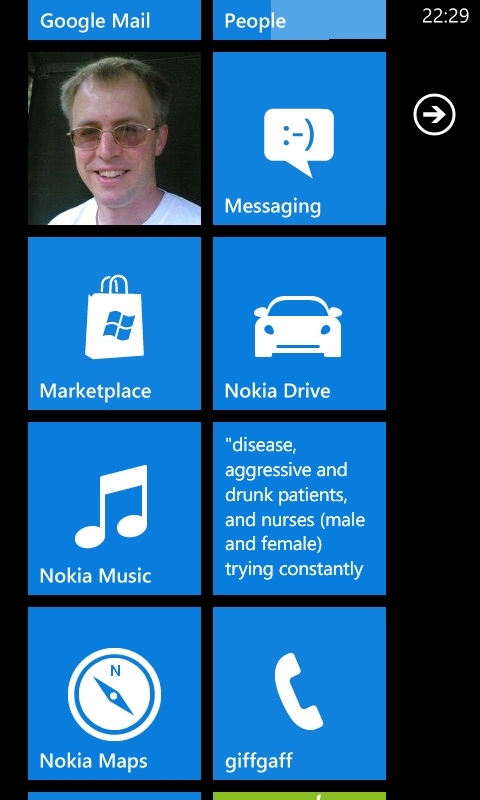 For a first version, Nokia Reading has come out with noteworthy polish, with no noticeable bugs. The book discovery process looks beautiful in Metro UI, and the whole application is very responsive. Amazon's Kindle application has been mentioned many times in this review for a single reason – it is the only other ebook platform present on Windows Phone 7, and it has a head start on Nokia Reading. Therefore, it's the incumbent to compete against. 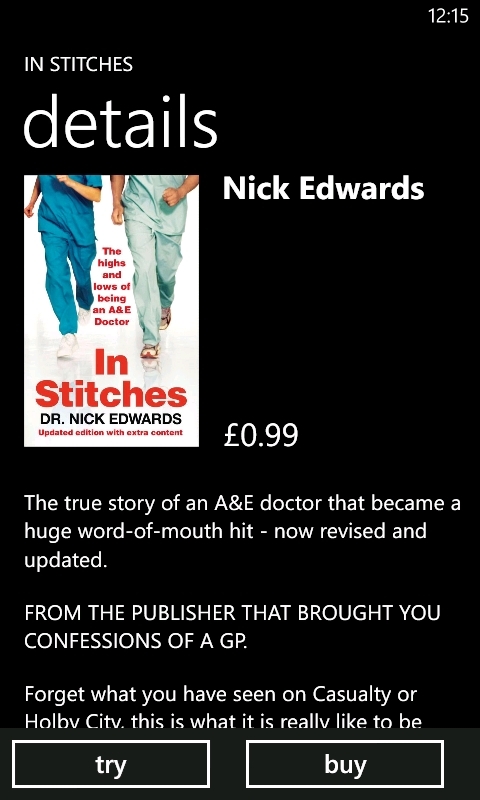 The purchasing experience on Nokia Reading is far more pleasurable than it is with Kindle. This is mainly due to the fact that the Kindle application utilises Amazon's mobile website to present its book store within the app, which reduces responsiveness and breaks the Metro UI experience. We mentioned above that the ebook DRM is authenticated via your Nokia account rather than an Adobe ID. This means that it would not be possible to take an EPUB file purchased from Nokia Reading and be able to read it on a compatible device or application (or take an existing DRM protected ebook file, registered to an Adobe ID, and read it in Nokia Reading). This scenario is somewhat academic though, as there is no way to transfer ebook files to or from a Windows Phone 7 device. Had Nokia gone with an Adobe ID system, and stored your purchases on SkyDrive, it would have been a completely different story. Integration with Adobe ID and the ability to side load content, via SkyDrive or some other method, is something we would very much like to see in a future version of Nokia Reading. Either that, or have Nokia Reading also released as a web application, with native versions for Android and iOS too. If you're new to ebooks, and/or you treat ebooks as a read once and forget type of purchase, then this issue will not be of concern to you. 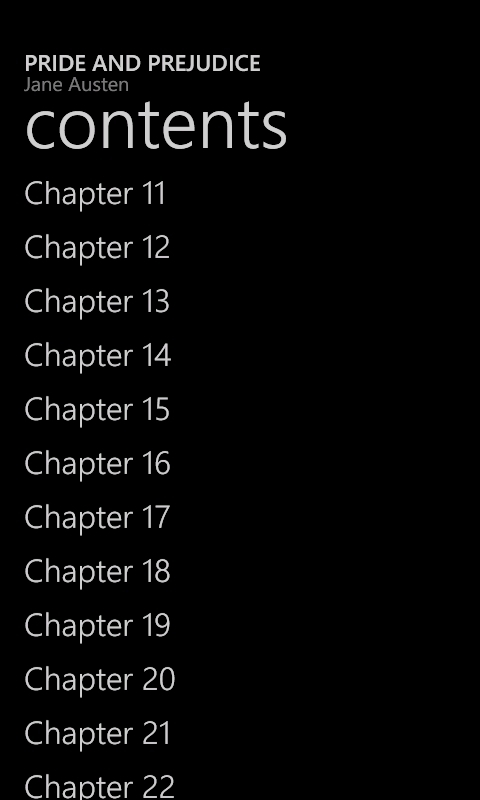 You'll read ebooks with Nokia Reading on your Lumia device, and then buy new ebooks elsewhere whenever you start using a different type of phone (assuming that everyone changes their phone platform from time to time). 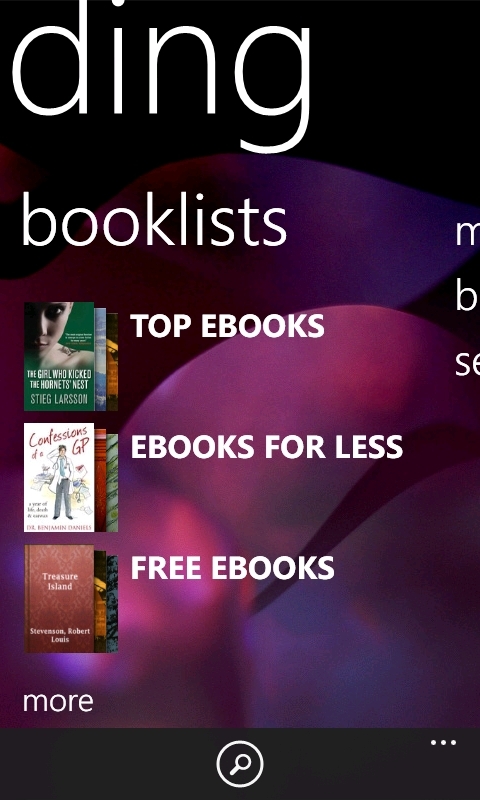 However, if you use multiple devices on multiple platforms, having your ebook purchases restricted to only your Lumia device(s), then there isn't a compelling argument to buy books from Nokia Reading. Especially considering that Kindle Books are mostly cheaper, and can be read on any mobile device and desktop web browser. Overall, Nokia Reading design and implementation is first rate; and will only get better as more features are added, like the promised News Stream and Audiobooks sections. Nokia Reading won't be for everyone though, as it requires consumers to not be concerned with their purchases being locked into a single product range. The lack of purchase portability is the only thing holding me back from giving Nokia Reading an exemplary score. Otherwise, this is an insanely good product, especially for a first version. You can find Nokia Reading in the AAWP Application Directory. 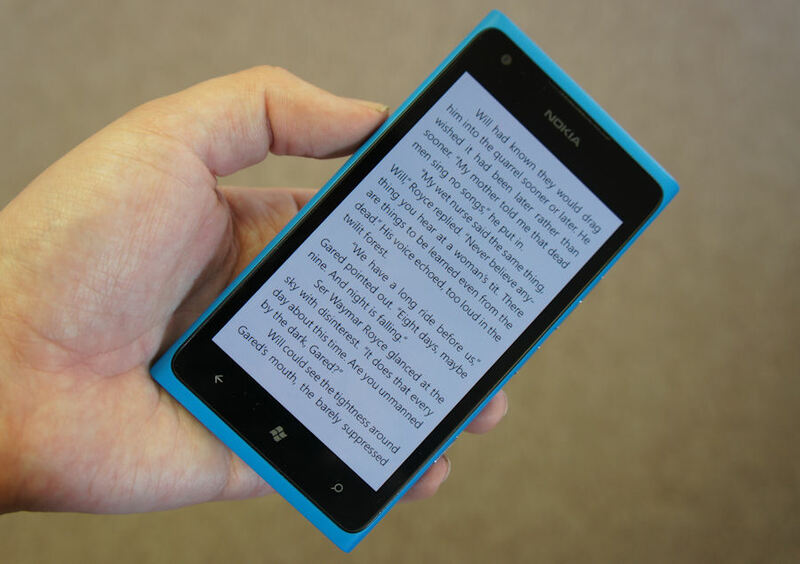 Note that at the time of writing Nokia Reading is only available in the UK, Spain, France, germany, Italy and Russia. More markets will follow.